M – F: 7:05 a.m. – 1:50 p.m.
Students are taught the skills and techniques necessary to become a Medical Assistant and obtain employment in a variety of healthcare facilities. This multi-skilled health professional is trained in clerical and medical office procedures, phlebotomy, EKG, X-Ray, basic patient care techniques and laboratory procedures. Medical assistants perform routine administrative and clinical tasks to keep the offices and clinics of physicians, podiatrists, chiropractors and optometrists running smoothly. They are involved in direct patient care and assist the physician or other health professional during examinations. Registration processes for Health Science classes vary by program. For information specific to Medical Assisting, please e-mail the counselor at Ruth.Eloi@browardschools.com. 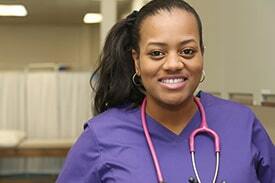 To get started in the Medical Assisting Program, sign up today for a program orientation! Demand for Medical Assistants is expected to grow about 20%* between 2015 and 2023. Entry level wages are about $13/hour**. Actual wages vary according to education, experience and certifications.